NEW ORLEANS (AP) — Drew Brees used one hand to hold his helmet and the other to wipe away tears. It was the first time the 39-year-old Brees had ever walked off of a football field knowing that he had thrown for more yards than any quarterback in the history of the NFL. And the Saints quarterback couldn’t help but be overwhelmed by thoughts of all the work and people who helped him get to such an esteemed point. 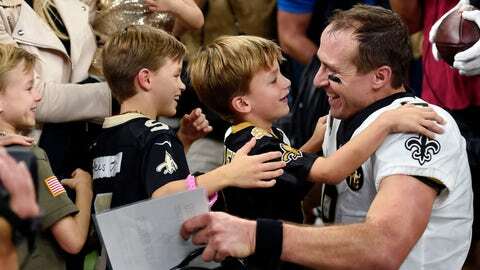 “I broke down and cried a bunch of times this week, just thinking about so many things,” Brees said after his latest NFL-record-setting performance in a 43-19 victory over the Washington Redskins on Monday night. “I think about all the people who have influenced my life in such a powerful way, and there were so many of those people that were here tonight, that witnessed this, so many people that I spoke to this week that are a part of this, and so many other still that I have yet to have a chance to reach out to. “Two of the people who had biggest influence on my football career certainly and on who I am, growing up, are my mom and my grandfather and they’re in heaven. They’re no longer here, but I know that they would be proud,” Brees added. The 6-foot Brees was lightly recruited out of high school in Austin, Texas, considered undersized for a quarterback at the major college and pro levels. He led Purdue to the Rose Bowl and was a Heisman Trophy finalist, but no NFL team picked him in the first round of the 2001 draft. Brees’ first team, the Chargers, discarded him after a shoulder injury in 2005, setting the stage for his arrival in New Orleans and his emergence as one of the most prolific quarterbacks ever. His latest outing would have been memorable even if no records were in play. He completed 26 of 29 passes for 363 yards and three TDs. His second touchdown was a 62-yarder to rookie Tre’Quan Smith that put Brees ahead of Peyton Manning’s previous all-time mark of 71,940 yards. Moments after that touchdown, the NFL halted the game for about three minutes so the ball could be handed over to Pro Football Hall of Fame officials. Brees was able to embrace his family and coach Sean Payton on the sideline. Smith is a third-round draft choice out of Central Florida who, in his fifth NFL game, became immortalized for his role in Brees’ record-breaking night. And Brees is glad to see Smith emerging into the player he showed signs of becoming in training camp. Smith finished with three catches for 111 yards and two touchdowns. “This kid could really help us, could really be a big part of our offense,” Brees said. Cornerback Josh Norman is supposed to be the centerpiece for a Redskins defense that had allowed the fewest passing yards in the NFL entering the game against the Saints, but he struggled just as much as the rest of the secondary as Drew Brees threw for 250 yards in the first half. Coach Jay Gruden even benched Norman for the first series of the second half, but the move backfired when his replacement, Greg Stroman, was beaten for an easy touchdown by Smith. Norman returned on the next series. Mark Ingram wasted little time putting his imprint on his first game back from a four-game suspension for use of a banned substance. He scored two of the Saints first three touchdowns on short runs and finished with 53 yards rushing and 20 receiving. Veteran running back Adrian Peterson was looking resurgent coming into a game against the team that traded him away early last season. He left the Superdome with a shoulder strain and was scheduled for an MRI. Before his injury, Peterson gained 36 yards on two catches out of the backfield, but had only 6 yards rushing on four carries.